Emulation One also sounds great, although more work would be required to bed its idiosyncratic but utterly lovable tones into the modern mix - unless an overtly retro sound is your goal, in which case it becomes even more of a winner. Great digital sounds, particularly on Drumulation One. By no means essential for everyone. 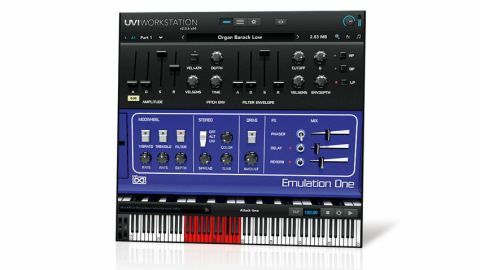 USB's Emulation II scored four stars back in March of this year, and now it's joined by a virtual realisation of its real-world predecessor, Emulation One, mimicking E-MU's classic Emulator and Drumulator samplers within the free (but powerful) UVI Workstation ROMpler engine. "Featuring over 200 sampled factory patches from a "fully restored unit", Emulation One is relentlessly nostalgic"
Featuring over 200 sampled factory patches from a "fully restored unit", Emulation One is relentlessly nostalgic. From acoustic and electric basses, through 'digital choirs', a range of acoustic and electric keyboards, some... shall we say, spiky orchestral strings, and an entertaining series of brass and wind instruments, to a small set of synth sounds, some splendidly weird effects and some lovely bells, it's all pretty crusty compared to the big, beautiful sample libraries we're used to today - but that lovingly captured digital crust is what Emulation One is all about. "Drumulation One, in particular, still sounds amazing - punchy, warm and wholly relevant"
Drumulation One gives you eight tracks of 16-step sequencing, with sounds from its 200ish-strong library of kicks, snares, cymbals, toms and percussion instantly interchangeable via drop-down menus. Each one can be tuned a long way up or down, with high- and low-pass filters available, but that's all you get in terms of shaping. Obviously, Emulation One and Drumulation One are both incredibly old-school, sonically, but the latter, in particular, still sounds amazing - punchy, warm and wholly relevant - and we could easily see it finding a place in the drum library of any urban producer.